The most Earth-like planet ever discovered is circling a star 600 light years away, a key finding in an ongoing quest to learn if life exists beyond Earth, scientists said on Monday. The planet, called Kepler-22b, joins a list of more than 500 planets found to orbit stars beyond our solar system. It is the smallest and the best positioned to have liquid water on its surface -- among the ingredients necessary for life on Earth. "We are homing in on the true Earth-sized, habitable planets," said San Jose State University astronomer Natalie Batalha, deputy science team lead for NASA's Kepler Space Telescope that discovered the star. The telescope, which was launched three years ago, is staring at about 150,000 stars in the constellations Cygnus and Lyra, looking for faint and periodic dimming as any circling planets pass by, relative to Kepler's line of sight. Results will be extrapolated to determine the percentage of stars in the Milky Way galaxy that harbor potentially habitable, Earth-size planets. Kepler-22b is 600 light years away. A light year is the distance light travels in a year, about 6 trillion miles (10 trillion km). Planets about the same distance from their parent stars as Earth take roughly a year to complete an orbit. Scientists want to see at least three transits to be able to rule out other explanations for fluctuations in a star's light, such as small companion stars. Results also are verified by ground and other space telescopes. Kepler-22b, which is about 2.4 times the radius of Earth, sits squarely in its star's so-called "habitable zone," the region where liquid water could exist on the surface. Follow-up studies are under way to determine if the planet is solid, like Earth, or more gaseous like Neptune. "We don't know anything about the planets between Earth-size and Neptune-size because in our solar system we have no examples of such planets. We don't know what fraction are going to be rocky, what fraction are going to be water worlds, what fraction are ice worlds. We have no idea until we measure one and see," Batalha said at a news conference at NASA Ames Research Center in Moffet Field, California. If Kepler-22b has a surface and a cushion of atmosphere similar to Earth's, it would be about 72 degrees Fahrenheit (22 C), about the same as a spring day in Earth's temperate zone. Among the 2,326 candidate planets found by the Kepler team, 10 are roughly Earth-size and reside in their host stars' habitable zones. Another team of privately funded astronomers is scanning the target stars for non-naturally occurring radio signals, part of a project known as SETI, or the Search for Extraterrestrial Intelligence. "As soon as we find a different, a separate, an independent example of life somewhere else, we're going to know that it's ubiquitous throughout the universe," said astronomer Jill Tarter, director of the SETI Institute in Mountain View. 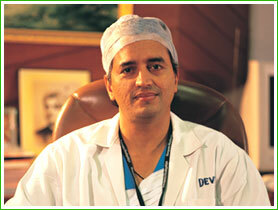 A chat with Dr.Devi Shetty, Narayana Hrudayalaya(Heart Specialist) Bangalore was arranged by WIPRO for its employees The transcript of the chat is given below. Useful for everyone. Ans : No. 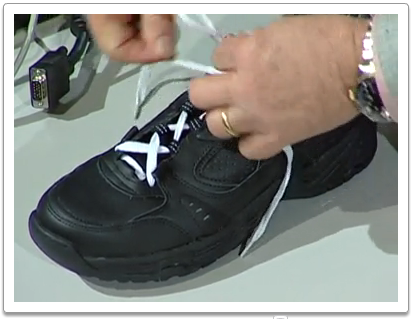 But it is ideal to have normal hemoglobin level to increase your exercise capacity. chair and going to another chair and sitting helps a lot. Ans : Diet, exercise, drugs on time , Control cho lesterol, BP, weight. reduce weight and changing attitudes towards lifestyles. Terry Moore directs the Radius Foundation in New York, which, as its website says, "seeks new ways of exploring and understanding dissimilar conceptual systems or paradigms -- scientific, religious, philosophical, and aesthetic -- with the aim to find a world view of more complete insight and innovation. The Radius Foundation is a forum for different views." The foundation has published several works that examine the intersection of religion and metaphysics with science and social action. Everytime When I Get Home A VANILLA Ice Cream, My Car Do Not Start !!! Every time when I get home a Vanilla flavored ice cream, my car do not start !!! And I don't know why ??? 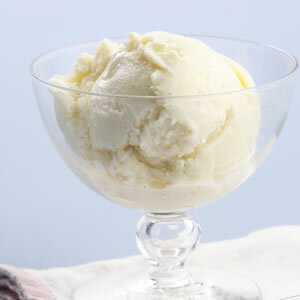 "This is the second time I have written to you, and I don't blame you for not answering me, because I sounded crazy, but it is a fact that we have a tradition in our family of ice cream for dessert after dinner each night. But the kind of ice cream varies, so every night, after we've eaten the whole family votes on which kind of ice cream we should have and I drive down to the store to get it." 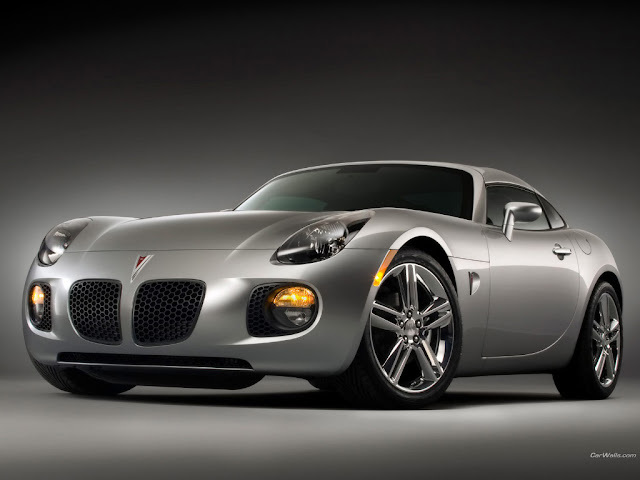 It's also a fact that I recently purchased a new Pontiac and since then my trips to the store have created a problem. You see, every time I buy a vanilla ice cream, when I start back from the store my car won't start. If I get any other kind of ice cream, the car starts just fine. The Pontiac President was understandably skeptical about the letter, but sent an engineer to check it out anyway. The latter was surprised to be greeted by a successful, obviously well educated man in a fine neighborhood. He had arranged to meet the man just after dinnertime, so the two hopped into the car and drove to the ice cream store. It was vanilla ice cream that night and, sure enough, after they came back to the car, it wouldn't start. Now the engineer, being a logical man, refused to believe that this man's car was allergic to vanilla ice cream. He arranged, therefore, to continue his visits for as long as it took to solve the problem. And towards this end he began to take notes, he jotted down all sorts of data: time of day, type of gas used, time to drive back and forth etc. In a short time, he had a clue: the man took less time to buy vanilla than any other flavor. Why? The answer was in the layout of the store. Vanilla, being the most popular flavor, was in a separate case at the front of the store for quick pickup. All the other flavors were kept in the back of the store at a different counter where it took considerably longer to check out the flavor. Now, the question for the engineer was why the car wouldn't start when it took less time. Once time became the problem and not the vanilla ice-cream, the engineer quickly came up with the answer: "Vapor lock". It was happening every night; but the extra time taken to get the other flavors allowed the engine to cool down sufficiently to start. When the man got vanilla, the engine was still too hot for the vapor lock to dissipate. And this gave rise to the study on the Flash point property of the fuel used and ways to standardize and control it. 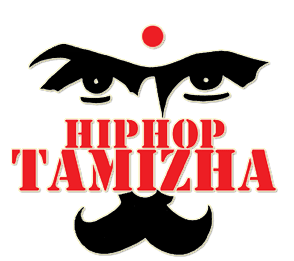 Election Anthem 2011 by Hip Hop Tamizha !!! Tamilnadu election fever is very high and hot campaigns are going on. And why all these people work for this particular election very hard. Any reason behind. Simple and single reason is for the betterment of the people. All these works are only for public who has got the complete authority to choose their next leader for the state. So are we ready for the election ??? Are we ready to vote for the right proper team who will lead our state and people with a great care and respect ??? If you don't have an answer for my question,the video below will inspire you to elect your right candidate. Vote for the leaders who will lead their nation to the glorification !!! The official Anthem " Ezhuvoam Vaa" has been written ,composed and performed by Adhi of HipHop Tamizha. Supporting Vocals have been done by Siraj, Karthick Srinivas,Aakansha ,Neil Sebastian and Jennifer. The Team behind the logistics of the song along with the artists are Aswin ,Naresh ,Vignesh Subramanian and Jeeva. Youth ExNoRa International has launched the "Clean and Fair Elections Campaign 2011" at Cuddalore on March 4th,2011. The aim of the campaign has been constituting the Citizen's Network by absorbing citizens from all walks of life , using a Cell Multiplying System by which each member will seek to enroll at least ten membersby explaining about the evils (corruption, caste-communal divisions and coercive politics) infesting the present electoral system and ways to intervene it, also stressing the importance of each and every citizen's right to exercise his/her right to vote. A whistleblower you haven't heard - TEDxRotterdam !!! At TEDxRotterdam, world champion whistler Geert Chatrou performs the whimsical "Eleonora" by A. Honhoff, and his own "Fête de la Belle." In a fascinating interlude, he talks about what brought him to the craft. 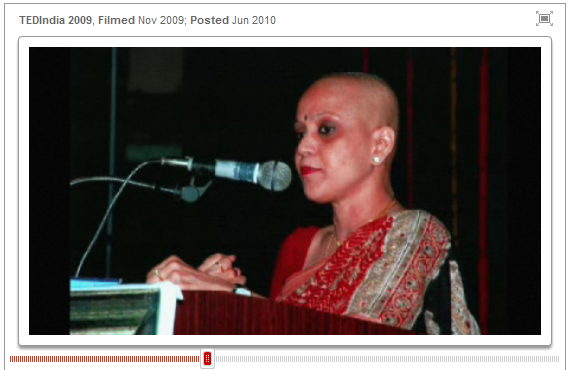 Ananda Shankar Jayant during TEDIndia 2009 @ Mysore !!! It was almost two years back, during 2009 TED came to India for TEDIndia Conference with a amazing lineup of speakers and performers. Favorite one of mine is the below performance by Ananda Shankar Jayant, a classical dancer who actually is affected by breast cancer. She danced to get out of her cancer. 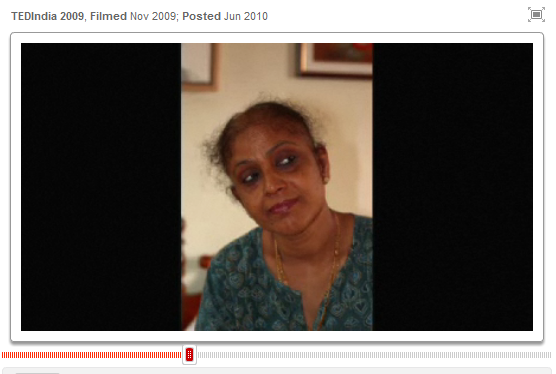 AnandaShankar fights cancer with dance She won her life battle and now she is well known all over the world. Here is the video from TED which shows her performance and talk. 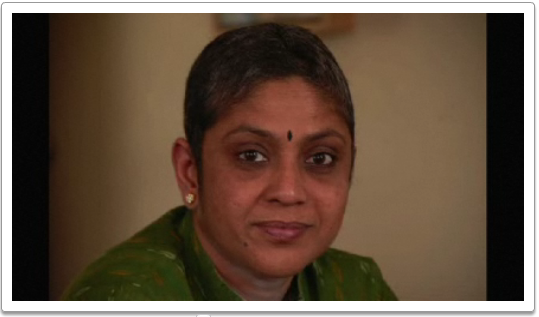 She is the one who started Shankarananda Kalakshetra. This may be an old data, but still this talk influences me to write this blog spot. Some has extraordinary power within them, and this women, i think has the combined talent and spirit and determination of what the whole world has. 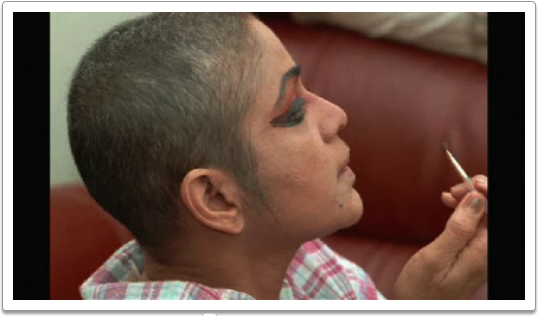 According to Ananda Shankar Jayant, she earned her strength for struggling against the cancer through her dances. She did not feel that her career of dance got over but instead she continued her voyage and designed her future in a better manner that no one would have expected !!! Hats off to her and TED !!! The image below is the art that she drew out of her legs while dancing !!! 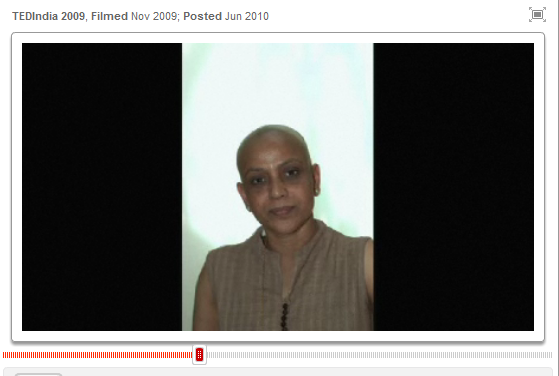 The pictures above shows you her struggle during her breast cancer treatment. 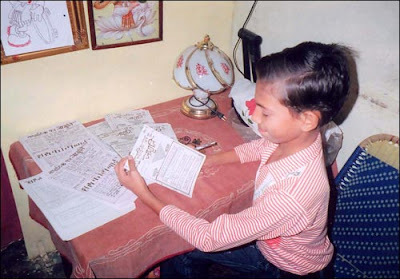 One who sees these pictures will definitely get a enthusiasm to live his/her life overcoming all the worst difficulties.